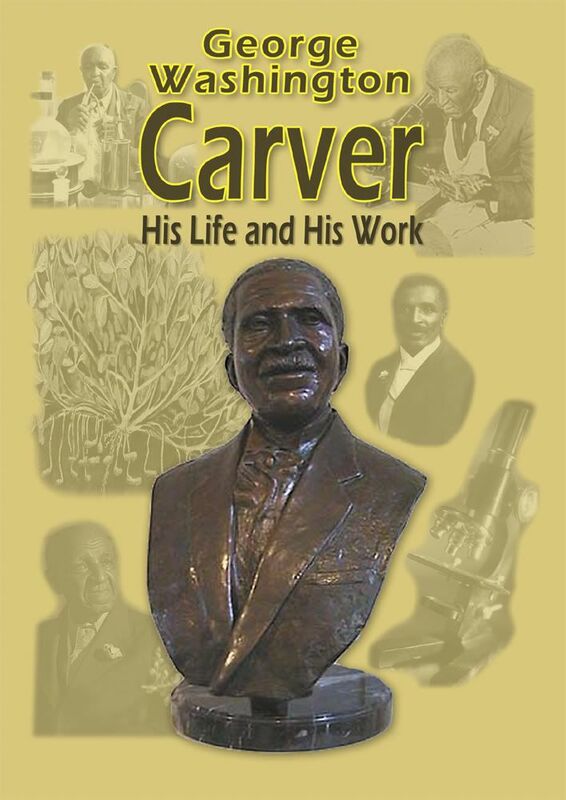 We got a chance to review a DVD that was all about George Washington Carver. It was a pretty short video (30 minutes) that packed in a lot of interesting information. The video is from Marshall Publishing, which has a lot of award winning DVD's, CD and books. They have won awards for their DVD series on Lots and Lots on Trains and Lots and Lots of Trucks. These would be perfect if you have little one's in your house that love trucks, or trains. Click here for a sample from the video on Trains. They also have a full line on Educational/Historical Documentary DVDs which includes ones on Lincoln, The Pony Express, Lewis and Clark the History of Bridges and others. We took a look at the George Washington Carver DVD on our recent road trip back to Minnesota. We have a DVD player/TV in our van that is only used when we are on road trips. When I brought this video along and told the kids we were going to watch it in the van....I will admit that they were NOT excited...at all. I guess they aren't the big, nerdy, homeschool kids that I dream they are! But, since we are the kind of parents we are, we said, "Too bad. We are watching it." Captive audience thing, you know. Plus, we were paying for the McDonald's Happy Meals! (Those only happen on road trips too). Rainman and I listened in from up front.....I actually laid my seat down, so I could sort of watch until my neck got sore from looking up. Unbeknownst to the kids, we had decided to quiz them after they watched the movie and their reward, if they did well, was that we were going to stop at Culver's for "real" food including some frozen custard. Believe me, Rainman and I were rooting for them to do well, because, quite frankly, we were getting sick of McDonald's ("McRib is back" and all)! The video is sort of a narrative put to beautiful, still pictures....with occasional voice overs portraying some of the characters. It did sort of remind of old slide show type things I watched in school, but the information that was portrayed was really interesting. Rainman and I said quite a few times...."hmmmm, I didn't know that, did you?" George Washington Carver was really an interesting guy, and pretty inspirational. He is probably most remembered for the over 300 uses for peanuts or their by products. He really accomplished a lot in his life, especially considering what outside forces he was up against because of his race. He really didn't let anything stop him. This is a DVD that will come out again whenever we study this time period. This particular movie is recommended for ages 4th grade and up, but, all of our kids watched it. I am pretty sure much of it went over their heads, but during quiz time, they did answer some of the questions! There are discussion questions available on the website to go along with the DVD, in case you don't want to come up with them on your own. It can be purchased through Marshall Publishing for $19.95, but, you can get a 15% discount by using the code TOSC1 at checkout. But, really, go take a look at the other things available on their site, because there is a little bit of everything for everyone. Oh, and where did we end up eating???? Culver's!!! Yay, nerdy, homeschool kids! We got the copy of this DVD for free, in exchange for an honest review of the product. The answer, as the evidence on my hips clearly shows, is a resounding, yes! In this case though, the ice cream will not be adding inches and unsightly bumps to my hips and thighs....but, instead, a way for my bigger girls to have fun, on-line. 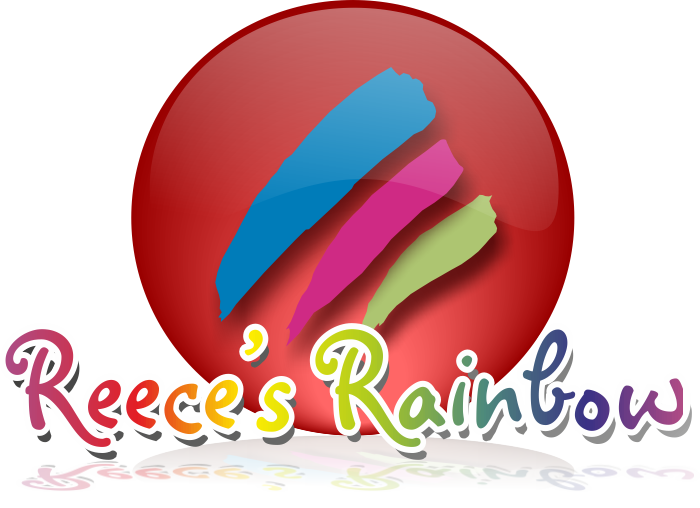 Always Ice Cream is a website devoted to learning games for girls ages 7 to 12. This site is everything a girl could want. Happy. Pink. Pretty. Did I mention that there was pink? ...with the stuff that girls want (whether it is politically correct...or not) .....wedding dresses....cupcakes....cooking.....clothes....music. My big girls, A-Girl and L-Girl got the chance to use this site, for two months, as part of a review for The Old Schoolhouse Magazine (TOS). They played games like typing, multiplication, synonyms, identifying countries in Europe, anatomy, dog breeds, babysitting, waitressing, dress the bride and many, many, more. They could have even practiced their Spanish or German....or worked on fractions! For me, as a somewhat modern mom, I thought that there was just the right balance between the fun, fluffy, girlie stuff and the not so stereotypically girlie stuff. There are games that I had to request that my girls do....like adding fractions and identifying the countries in Africa.....but, they did end up having fun with them....they just didn't necessarily appeal to them over the ones that designed their wedding dress or their own Victorian outfit! See? Can you see all the choices on display along the sides? The site has a MiniWorld where they can design and decorate their own homes...or castles. They use the "scoops" (of ice cream) that they earn from playing the games to buy things like furniture or even a bigger house. It also has a video section that has lots of videos to choose from....all the way from silly ones- a panda bear sneezing....to the more practical - to how you repair a flat bike tire.....how to decorate a cake.....how gold is made....and even how to multiply fractions. Always Ice Cream also has a parent summary page that lists basically everything that your daughter has done on their site in the last 90 days. What games they have been playing, what levels they have mastered and what medals they have been awarded. There is a chat function capability on this site too. We didn't use it as I don't think my girls need to be chatting (even safely) with other strangers around the world. But, their site has earned the Privo Kids Privacy and Safety certification., so, I believe that it would have been safe for them.....however, I still didn't think that it was necessary for them to chat with girls, yet. You can try a Free Trial of Always Ice Cream or you can subscribe for $4.99 a month....but you get the first month for only $0.99! You can go month by month, get an annual membership for $29.99, or, get a lifetime membership for $99.99. You can click here for more detailed information on the various membership options. So, the question I asked at the start begs to be asked again.....Isn't it always time for ice cream? I already said yes.....but, now, L-Girl and A-Girl also say, yes! Although we are talking about 2 different kinds of ice cream.....the fact remains, that, Yes....it is Always time for Ice Cream! The girls and I received 2 months of free access to Always Ice Cream, in exchange for an honest review of the website and its features. To read what other TOS crew members thought about Always Ice Cream, click here. I hear that phrase quite a bit. I heard it a lot more in Minnesota when I worked outside of the home....but I sill hear it in Georgia. Because I have 6 kids. Because I cook for the family most nights. Because I am involved in my church. 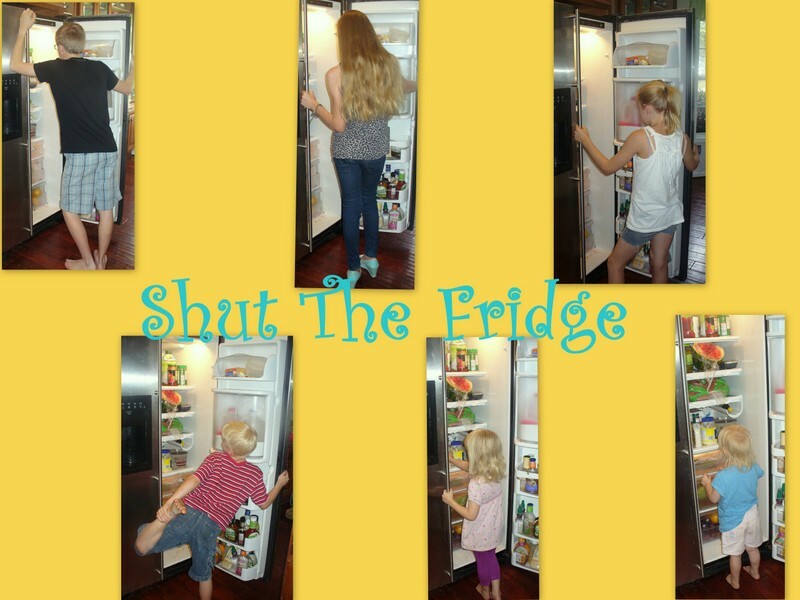 Because my kids are involved in lots of "stuff". But, I have a confession to make. I don't get it all done. I do a pretty good job of keeping my kids and Rainman loved. I do a pretty good job of keeping my kids and Rainman fed. I do a pretty good job of getting the kids educated. We are almost always on time for any appointment or commitment. But, my house is a mess. My stairs almost always hold enough clothes for all the neighborhood kids, as well my kids. There are no words to describe this countertop. Like my classy wine rack....full of stuff??? This is actually pretty contained and neat and pretty for us. You would think about 20 people lived here based on the amount of shoes we have scattered near this shoe basket in our entryway. I cannot remember the last time I actually truly mopped my floor. I do spot cleaning when the kids spill stuff....but I haven't done a full all out mop in quite a while. There are always crumbs on the floor....no matter how much we sweep or vacuum....some little person will come behind us and spill some cereal or crackers....and then, we are back at square one. My mom really taught me better. I have tried to follow Fly Lady. I have gotten my sink all shiny. I have tried to take care of my "hot spots".....but, to no avail....still a messy house. I have tried having a container for mail and things that I don't know what to do with when they immediately come into the house. I know. It is a granola bar box....but still I had hoped it would contain things....as you can see...it didn't. My laundry room is in the background....that is the place where people toss stuff that they don't know what to do with either....makes it hard to get in there and actually wash all those clothes that were left on the stairs! I want to make my mother proud. I want to have a peaceful, relaxing house for all of us to live in. Maybe I will give Fly Lady another try. Are you somebody who does do it all? Any advice for me on how to manage this? We got a new game to review at our house, called Scruble. Scruble....makes me think of the word inscrutable. They sort of sound alike, don't they? Maybe it is just me....thinking about my dad. He always used to say that women were inscrutable. The actual definition from Websters of inscrutable is...."not easily understood, enigmatic". Scruble is actually....Scruble Cube, a 3D word game and, unlike women (according to my Dad anyway), it is easily understood. This game is touted as sort of a combination of Scrabble and Rubik's cube (which, by the way, I had, like, totally mastered in the 80's - thank you very much!). See it? Far left.....4 points. If you aren't playing alone, the first player takes a turn and forms a word, then adds up the letter score - just like in scrabble - but, unlike Scrabble, the next player can form a totally different word and not connect it to the first word....or, they can get bonus points if they do attach it. There are other ways of getting bonus points, like if you have an 8 letter or more word, you get 10 bonus points, or if you are able to get your word to spread over 3 sides of the cube. 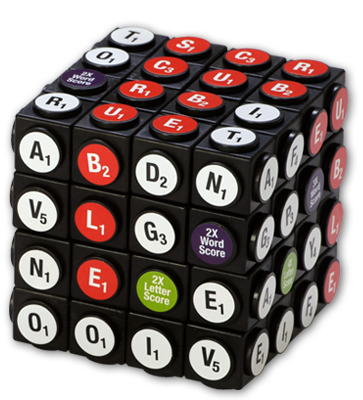 There are also extra bonus pegs spread out on the cube....like 3x letter.....or 2x word scores. The game comes with cute little score cards and a little hourglass timer. We actually didn't use the timer much because it seemed like too much work to keep turning it over. One of these more advanced ways of playing the game is to "spell" the abbreviations for the Periodic Table of Elements. There are lots of math game options too - because you do actually add up the scores for your words. There are lots of ideas on how to use this in a classroom setting to have teams competing against each other starting with giving them one minute to spell 3 letter words, and moving up each round in both time and number of letters. Or, even one where you target a specific vowel each round and they come up with the best word they can using that vowel....with bonus points if they get a double vowel word....like moon. One version of the "educational" game we used was the one where you had to make a word, add up its points and then look up the definition of the word in the dictionary. Honestly, though, we used this game a lot when we were alone and just needed to fill some time....sort of like people do with Solitaire. This will definitely be coming with us on upcoming road trips - because it can be used by individual kids (and me) or we can start a competition among them ( just in case there isn't enough sibling fighting already happening in the van)! We had a lot of fun with this game. This one is going into our game night rotation and I am pretty sure it will stick around. Go check out their site and check out some of the fun you can have with the Scruble Cube. You can get Scruble Cube directly from their site for $24.95. If you really use your cube a lot, you can even get replacement letters for your cube for $4.95. Check out what other TOS reviewers thought of Scruble Cube here. We received a free Scruble Cube in exchange for a honest review of the game. Answer: The symbol CL is the abbreviation for the element.....Chlorine!